Explanation: A symphony of planet-wide observations began abruptly on March 28 when the Earth-orbiting Swift satellite detected a burst of high-frequency gamma-rays from GRB 110328A. When the same source flared again after a 45 minute pause it was clear this event was not a typical gamma-ray burst. Twelve hours after the initial fanfare astronomers using the 2.5-meter Nordic Optical Telescope chimed in with a mid-range observation of the optical counterpart. Early the next day the explosion was picked up in baritone low-frequencies of radio waves by the ELVA radio dishes in the USA. Later many optical telescopes, including the 8-meter Gemini North telescope in Hawaii, began playing along by tracking the optical counterpart. 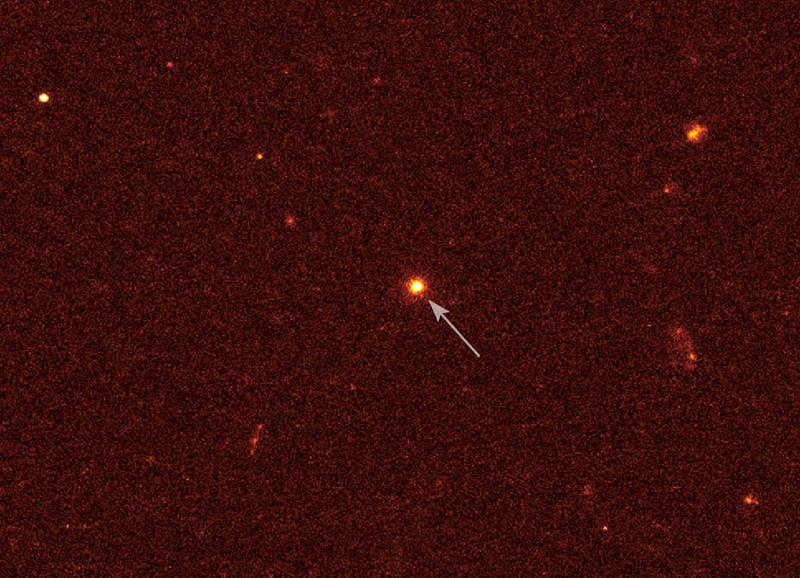 The unusual source was spotted at a higher register in X-rays by the Chandra X-ray Observatory and was intermittently followed in the even more soprano-like gamma-ray range for a week. 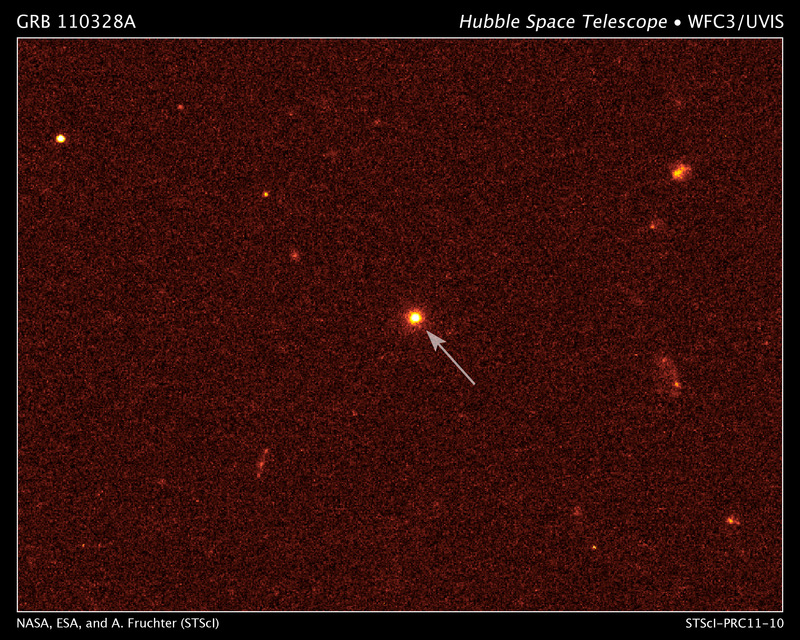 Joining the chorus, Hubble Space Telescope recorded this image in optical and infrared light, confirming that the flash was located along the path of a galaxy at redshift 0.351. If associated with the galaxy, this explosion occurred when the universe was about two thirds of its present age. There is much speculation that the unusual gamma-ray burst was a star being ripped apart by a supermassive black hole in the center of a galaxy and the puzzling features of the distant detonation are still being explored.